AVID's listening centers allow students to work and learn in groups. Each position on the Jack Box comes with its own volume control. The carrying case is tough ABS plastic to prevent damage, but is lightweight to make storing and moving easy. Includes (8) AE-808 headphones, 18KP35S Jack Box with volume control, BB-992 Boombox, and carrying case. 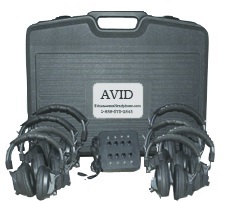 Please Note: This product will be drop-shipped to you direct from Avid which might lead to an additional lead time. Helps prevent 3.5mm pin breakage. Even more sounds. Even more possibilities with 4 included instruments! With 6W of output power this PA is perfect to project voices in a classroom. Not only does it offer 20W of power, it also lets you record your lessons for students who are absent! A lightweight portable PA system which is great for times when movement is necessary.